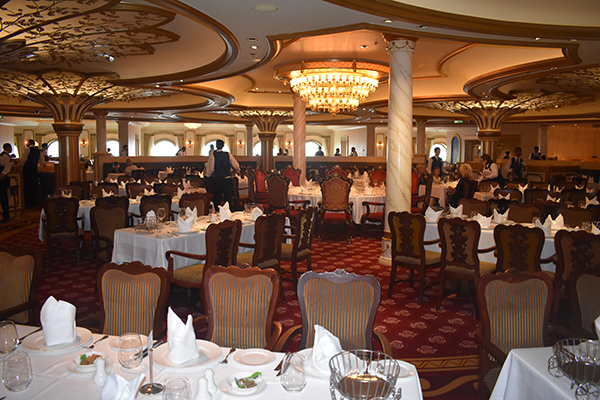 There are three main restaurants on a Disney Cruise ship. One of these restaurants is Lumiere’s on the Disney Magic, Triton’s on the Disney Wonder, and Royal Court on the Disney Fantasy. They both serve brunch throughout the morning with American fare options, with items like eggs benedict and a waffle sandwich served with dulce de leche and rolled in cinnamon and sugar. 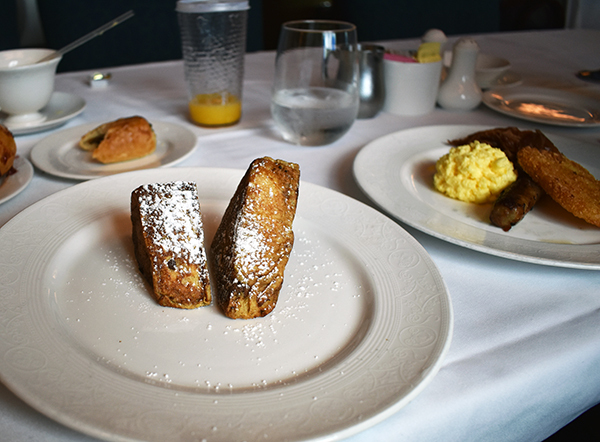 During the dinner dining rotation, French cuisine is served with options like lobster, duck and deep fried brie. This restaurant is located near the main entrance to the ship, visible from the glass elevators and is beautiful in style, elegance and architecture with huge soaring ceilings, elegant white tablecloths and stunning views of the ocean. This is my preferred sit down restaurant for breakfast. The kids love the unending fruit options, I love the sweet and savory choices, and Gabriel prefers Cabanas. 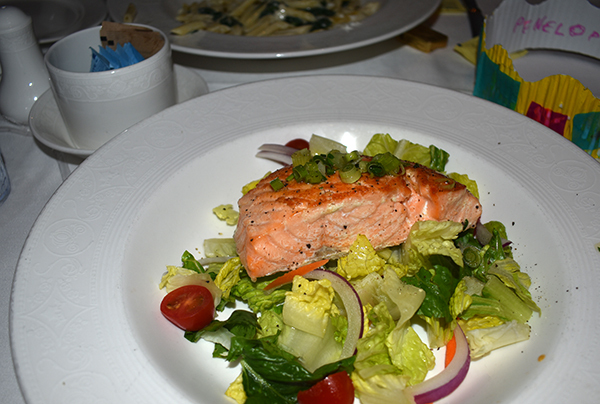 We tend to be late risers, and unfortunately Lumiere’s/Triton’s brunch stops by mid-morning which is our only complaint, however, Royal Court offers a Romaine Lettuce Wedge salad with a Salmon Steak that I ate five times last week. I love sitting by the large porthole windows that overlook the water and take in a quiet and leisurely breakfast as I warm up to the idea of not sleeping. The most beautiful part of this restaurant is the huge mosaic located along the back wall of the restaurant. It fills up the entire facade of the restaurant and is a show stopper. 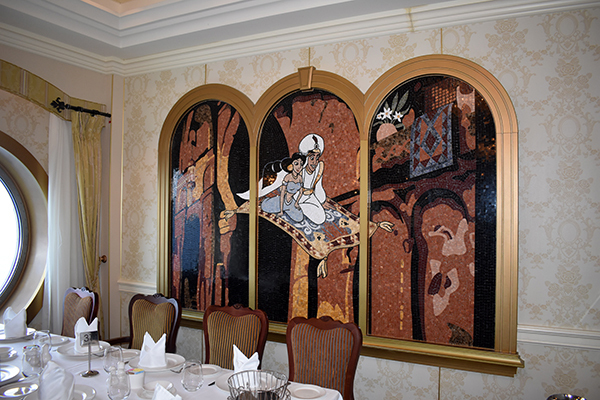 At Lumiere’s the restaurant resembles a grand ballroom with the feature embellishment an exquisite painting of Belle and the Beast including all your favorite characters. 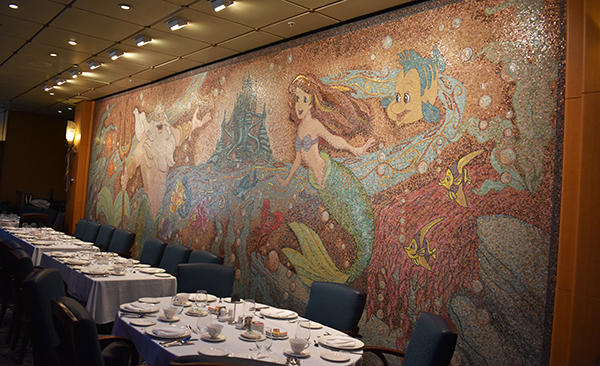 At Triton’s it is a gorgeous tile mosaic of Ariel brought to life in epic proportions. The lights at Triton’s are a gorgeous shade of bio-luminescent underwater blue shaped like windows to the ocean which float above your head. At Royal Court the restaurant is covered in portraits of every Disney Princess with her Prince Charming. Carriages adorn the railings, and serve as bread baskets. It is as elegant as a princess would expect. ► For Kids: Kids will love the celebratory atmosphere and the chance to be transported into one of their favorite movies. Like all Disney Dining options, you won’t find it hard to find something they love to eat, or give them the chance to try something new. 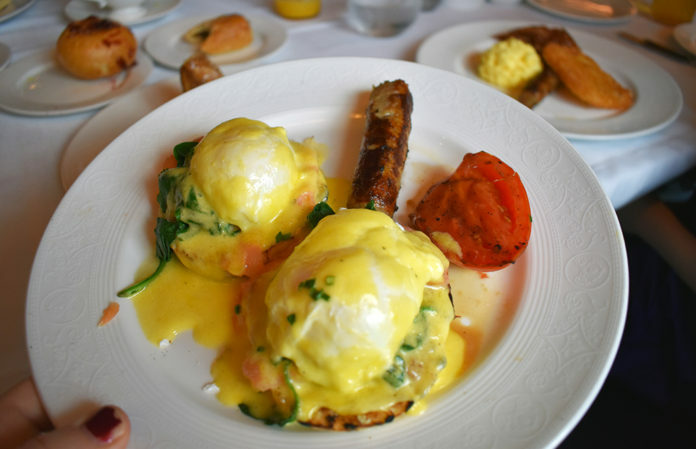 Whether or not you choose to dine here for brunch, you’ll enjoy a meal here at least once during your cruise on the rotational dining circuit. ► Nap-Time Version: Sweet and savory dishes make up the menu for both brunch and dinner at Triton’s, Lumiere’s and Royal Court at this classic restaurant resembling scenes from your favorite Disney movies. 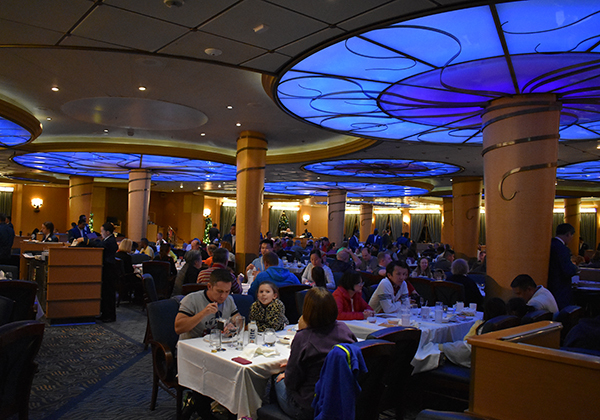 Animator’s Palette and Tiana’s Place make up the other two dining options on the Disney Wonder. 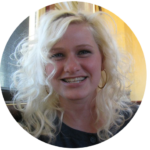 Check out both reviews and tell us which one is your favorite!